Old photographs. I love old photographs, the older the better. I love them, but I am haunted by the people in them. I am not talking about spirits or spectres. What it is that haunts me is a sense of absence. The absence of the people in the photographs themselves-the fact that they are no longer here with us, their energy and essence now gone, creating a vacuum where they once took up space. But it is not just an absence of the people that haunts me. I am haunted also by the absence of resolution. In most cases our questions remain unanswered, we will never know who these people were, what was in store for them after these photographs were taken. Did they go on to have good lives? Were their lives a success, or a struggle? Did they escape the squalor? Do their lines continue down to us today? It is the human need to know, which cannot be fulfilled. 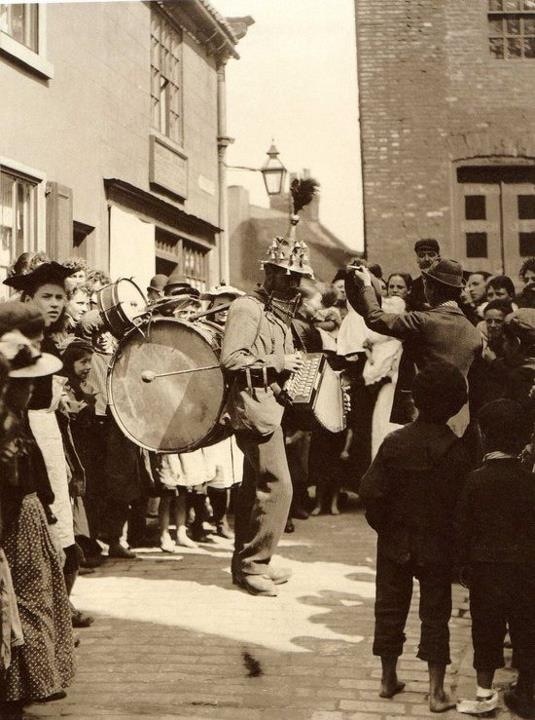 This photograph here was taken in the late 1800’s on Church Street in Whitby, that great historic town situated on the Yorkshire coast. A place where Dracula makes a strange bedfellow of St.Hilda. I have been there many times, walking along that same street which leads to the 199 steps that climb up to St.Mary’s church and the abbey ruins. The next time I am there I will have this picture in my mind’s eye, overlaying the present scene with this 19th Century one. The one man band, the curious crowd. I am conscious sometimes that I may read into the scenes that I survey on film my own ideas and understanding of the periods in which they were taken . But sometimes there are signs that act as indicators of the poverty, or conversely, the affluence, of the people involved. Look at the two little boys to the right of the photograph. Their backs are to the camera, their faces forever lost to us. One child is barefoot upon the cobbles, the other child wears a boot on one foot while his other is bare, with some type of rag or bandage wrapped around his ankle. But it is another person in the photograph who draws my eye. To the left of the photograph a girl has spotted the photographer, and casts an inquisitive glance in our direction. In doing so she is forever connected to us. A curious glance that bridges the centuries. After the shot was taken, maybe she turned back to the spectacle that first attracted her. And then what? The performance over, what destiny took her from this moment of immortality? Did she escape from this Yorkshire town, perhaps swept away in a great love story, becoming a mother and grandmother along the way? We will never know. In shifting scenes and shadows she is gone from us forever. But her image remains. An unknown person trapped in a particular place, a particular time. 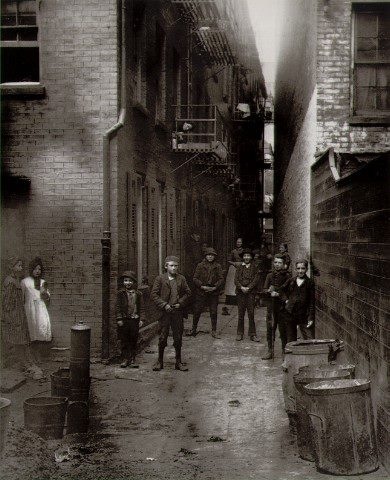 I like this photo-Ragamuffin Alley. This motley crew look like Fagin’s gang. Perhaps that is Mrs Fagin looking down from the upstairs window. You could imagine the two girls stood to the side, talking about the boys assembled here, the way girls have done since time immemorial, whispering behind coy smiles. And what of the boys themselves? From our vantage point we know the spectre of World War One was looming ahead. Were any of these lads called to shores they had no expectation of ever being able to visit? Do any of them still lie somewhere on foreign soil? Last year I stayed for a few days in Rothesay, on the Isle of Bute, Scotland. There is a hill there known as Canada Hill. After tearful, emotional farewells on Rothesay Pier to loved ones who were leaving for a new life in Canada, relatives would scramble up this hill in order to catch a last glimpse of the ship as it disappeared from view. 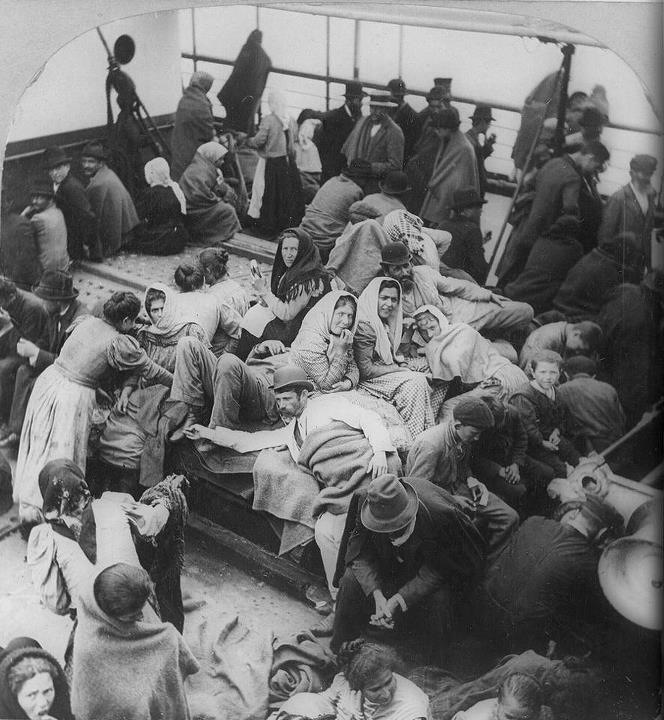 This photograph here was taken of emigrants en route to Canada. It doesn’t convey a sense of excitement at the prospect of new beginnings. You can see people huddled together in shawls and blankets against the cold. The women, the fulcrum of the families, gathered together in the center, before them young lads huddled conspiratorially in conversation. Was their journey a matter of choice? Were they compelled by necessity, by desperation? How many people alive today as proud Canadians owe their lives and nationality to the people captured in this photograph, making the courageous decision to make the journey to an unknown, New World? I think of that vantage point now known as Canada Hill. People clinging to each other, families cleaved in two, watching a vanishing, ever diminishing shadow sail through the still water of the Firth of Clyde. Capturing one final, internalised image from the far horizon, in the days before telephones and Skype, to replay over and over on cold winter nights. Dreaming about loved ones, not knowing. Waiting for news. I love old photographs. But I am haunted by a sense of absence. I have a six year old daughter who doesn’t miss a trick. Acutely aware of the world around her, she notices things that more often than not passes me by. Constantly asking questions, like kids do. Sometimes tactfully, sometimes bluntly. But always curious. Always questions. Sometimes, instead of asking questions, she points out things to me. Suddenly our roles are reversed, as she invites me into her place of imagining and I get to see just how the world looks to her. I took her to school this morning, and she noticed yet another sign of winter handing over the reins to spring. Automatically I looked towards the school fields. She was right, the fields lay empty and still, when recently the running lanes of endless personal triumphs had been agog with a gaggle. I don’t even know if that makes sense. Agog with a gaggle. But anyhow, there had been a couple of dozen of noisily honking Canada Geese, competing note for note with the din of the playground. From a distance the children would be delightedly curious, but up close they would soon be intimidated. “Watch it doesn’t bite you,” one concerned mother had warned. Do geese bite? Or just peck? Either way, these birds had attitude, and the children wisely would back away once issued with a warning hiss. From the geese, that is, not the mothers. “Canada,” she finished for me. Isn’t the logic of children marvellous? The connections they make are delightful and insightful. A logic that wraps itself around my own linear thinking and then tap dances all over it. Ornithologists and naturalists do all sorts of studies, engaging research into everything from climate change to magnetic fields, to discover all they can about adaptation and the things that birds do to survive. 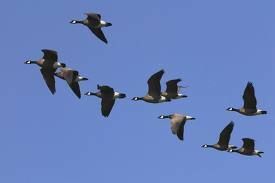 Birds are tagged or chipped in an effort to establish migratory routes, and the hazards that they have to surmount every year flying from and to their natural habitats. Science and technology combine to answer all different questions today about the lives of our wildlife that we previously have only wondered at. But who is to say that the simplest answers are not actually the right answers? 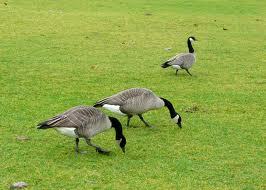 Geese fly away in spring because they are scared of bees. Nailed by a six year old. In your face David Attenborough. The original 19th Century Manchester magazine City Jackdaw used to have a regular feature named ‘Claws of the Week’. I thought it would be fitting to include in my Blog a ‘Claws for the Weekend’, giving a nod to the inspiration for, and local roots of, the title of my Blog. When I was a teenager I used to read some William Blake, like his Songs of Innocence and Experience, although I have never read his longer prophetic books. Hope you all manage to attain such vision this weekend, without the use of chemicals. This brought back so many memories, and so many emotions. In the end all that pain was worthwhile……eventually. I have no early memories of being read to. My Mam worked nights as an auxiliary nurse and my Dad, to my knowledge has never read a book of literature in his life so far, so I was left to my own devices. No bedtime stories then, unless I was reading them to myself. We had books around the house though. Encyclopedias about everything in the world. Sports books too. Football mostly and some Boxing ones. This is what people do the world over. They carry on. 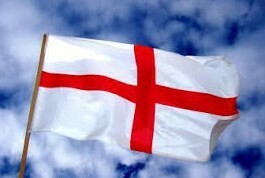 Today, here in an overcast, breezy England, it is St.George’s day. How much we can say we actually know about the real St.George is very little. I ask my kids, and all that they can come up with is that he killed a dragon. And they also recognise his flag, of course. Personally I think St.Aidan should be England’s patron saint. As the Apostle to the English, and with a little more verifiable information available to us, I think he has the greater claim. I love the history and stories of all the Celtic and British saints that have walked these same scattered islands that I do now. Among my favourites are Aidan and Cuthbert. But that’s for another day. There was a time, when asked what my national identity was, I would reply “English.” But then I began looking into my own family history. What I have discovered, up to now, is that I am at least the fifth generation of Murray born in Manchester, England. Also that I have four different lines of Irish ancestry, and that my surname originates from Scotland. It goes further. Having the Y-chromosome of my DNA analysed, that is my paternal line, I have discovered that my genetic signature belongs to a group that is prevalent in Ireland and northern and western Britain. I am from probable Celtic descent, with strong similarities to the genetic signature of the Basques of Iberia. This suggests colonisation of Britain and Ireland by ancient maritime migrations along the Atlantic coast of Iberia, France and Brittany. A journey can be traced through western Europe and the Middle East right back to a particular man who lived in Africa 80,000 years ago, to which all men alive today can trace their paternal line. I have not had my maternal line analysed yet, but with the female, mitachondrial line we can go back even further. Everybody alive today can trace their maternal line back to a single woman who lived in Africa between 150,000-200,000 years ago. So, although they never met, and lived thousands of years apart, we have our Y-Chromosome Adam and Mitochondrial Eve. Back here in the present, I know someone who was very anti-Celt, claiming to be of Anglo-Saxon origin. He immersed himself in the history, writings and culture of that race. Much to his chagrin, he later discovered that he had Welsh ancestry. Of course, when we talk about Celt, Anglo-Saxon, Viking, whatever, it is all a romanticised perception that we hold. But the point is that we cannot be sure of our blood. There is no such thing as a pure race. These islands have for thousands of years been subject to incoming waves of people of all races, either with intentions of peaceful settlement or of conquest. We truly are a mongrel nation. Go back far enough and we are all related. All connected. What a revolutionary, healing concept this could be, if people would only grasp it. 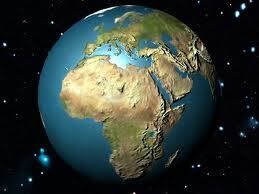 Everybody alive today and tomorrow are descended from the same place, from a people of one skin. The Irish contingent here in Manchester put on a great show on St.Patrick’s day. Every year it gets bigger and bigger, the town center being transformed into a great sea of green. The English by comparison no longer really embrace St.George’s day. Apart from isolated pockets, it mostly goes by unacknowledged. 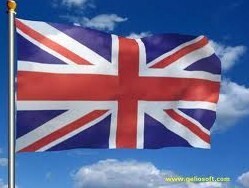 A few flags fly outside pubs and shops, desperate to drum up trade. Among the ex-pats throughout the world though, there seems to be more enthusiasm to embrace St.George’s day. Perhaps being cut off from your roots creates a need to continue your traditions, to celebrate your cultural heritage. Without roots and tradition we become disenfranchised. We drift. I think we should always be proud of where we have come from. And also of what we contribute to the place where we are now. Happy St.George’s Day to all of the diaspora, wherever this day may find you. 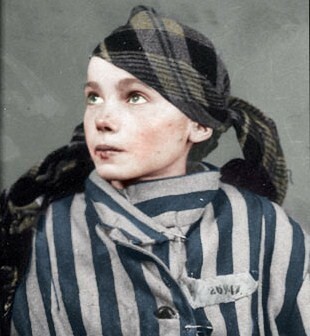 I have never been to Auschwitz. I did go to the Terezín camp when I was in Prague a few years ago. Although used as a ghetto and not an extermination camp, tens of thousands died there of hunger, disease, or direct abuse by the SS units known for their cruelty. What stuck in my mind was a wall that symbolised the different fates of people governed solely by the circumstance of their birth. On one side of the wall, the children of the camp commander would play happily in a swimming pool, much in the manner of children the world over. On the other side of the wall prisoners would be lined up to face a firing squad. Life and death separated by one thin wall. In the Jewish museum in Prague, there is a collection of drawings made by the children of Terezín. In total there were over four thousand, made between 1942 and 1944. A prisoner, Mrs Friedl Dicker-Brandeis, organised clandestine art classes for the children of the camp to distract from the horrifying situation they were in. The drawings were a vehicle of expression and communication, but also the classes acted essentially as a means of therapy, channeling the children’s extreme emotions onto paper. Many of the drawings revealed the hope for a return home to the safety of Prague, depicting crossroads, signposts and routes out of the ghetto camp. For all but a few this hope was unfulfilled, as they were mostly all moved on to Auschwitz. You can see the cut to her lip. Hers is just one recorded face among millions lost, in a terrible and shameful chapter of our history. Sometimes a photograph or a story touches me so deeply that I feel moved to record and share it. To keep both the memory and the story alive. If in doing so I have caused you to be disturbed or distressed, I apologise, but I think it is important. To this tragic story, and these moving photographs of this young girl, there is nothing more that I can add. They stand together as an indictment.